Pablo and I have decided to use cloth diapers on our Cinnamon Bun. It’s not to say we’ll never use a disposable, especially when we’re living in a hotel room in Sri Lanka, but we’d like to use cloth as much as we can. We’ve already got 3 cloth diapers: 2 used that I bought at a sale back in May, and 1 brand new that little T. brought as a gift for her cousin. 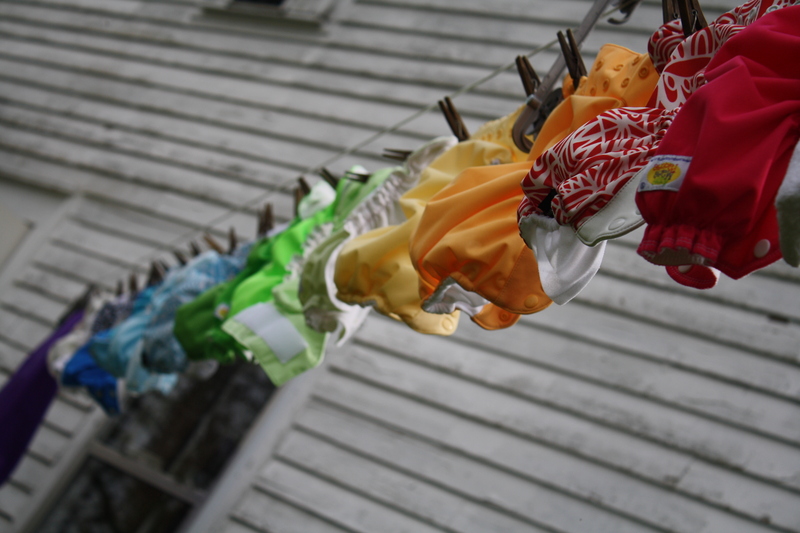 1- Money: Cloth diapers cost ~$300-$500 to start, plus the cost of washing (energy, soap and water). That’s probably less than $1000 in total. Disposable diapers cost ~$2000-$3000 over the time a baby uses diapers. 2- Environment: This is not as cut-and-dry as you’d think… If cloth diapers are bought brand new, used only for one child before being discarded, and machine dried, the environmental cost of manufacturing, energy and water pollution may very well equate that of manufacturing plastic diapers. If your electricity company produces from a coal plant, machine drying diapers is an important air pollutant. But if you’re going to buy used diapers, reuse your cloth diapers for your second child (or a cousin or friend) and/or line dry your diapers, then you’ll be keeping a few tons of waste from the landfills! I found this article on the Canadian Government website. And while we’re at it, I think I’d like to get some reusable wipes and liners... We’ll just try to make it a habit to hang all that stuff to dry! Is there anything cuter than a line full of colourful diapers? And our dry Mountain climate will help anyway! Hi Gen, I am loving your blog. I am a new follower and enjoying your adoption journey. I stumbled upon your blog while just goggling information, I hope to adopt someday. I am currently a day-care teacher and am torn on diapers. I really like the idea of cloth but don't really want to deal with cleaning them. I might be more on board if I had a cleaning company to use. Thanks for stopping by! I hope you do get to adopt someday. It's a tough but intense and exciting journey! There certainly are cleaning services that will provide all the material and pick-up and deliver the diapers for you. I don't know what your motivation for using cloth is. If you're interested in the cost savings, I believe those services cost about the same as using disposables. Ask for a quote, disposable are about $2000-3000 for a kid over 2+ years. Anybody who knows more can jump in, please!